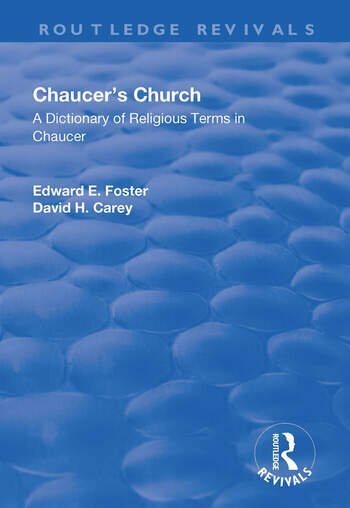 This title was first published in 2002: The purpose of "Chaucer's Church" is to provide clear, concise and reliable explanations of every term Chaucer uses that has a religious, liturgical, or ecclesiastical meaning. It uses a dictionary format, arranged according to Chaucer's spellings, to make information readily accessible for students, teachers, critics, and the general reader. The shorter entries present brief definitions which are more lively and illuminating than those in standard dictionaries or glossaries; the longer entries are in fact short essays, with suggestions for further reading, on broader or more complex topics. In all cases the entries concentrate on lucid and accurate presentation of the meanings that the terms had or could have had for Chaucer and a 14th-century audience. The book is a compact but precise reference for readers of all levels of experience on the vocabulary of fourteenth-century religion, which is often unfamiliar or only hazily understood. A careful system of cross-references guides the reader to related terms, so that individual entries can be further explored in related or larger contexts. The book may also be browsed or read on its own, for the entries taken together, especially the brief essays, provide a coherent introduction to the Christian world of the late fourteenth century. In Chaucer's Church, the editors have succeeded in compiling a volume that combines ease of use with readability and rigorous accuracy. This book provides convenient and trustworthy access to Chaucer's religious world.